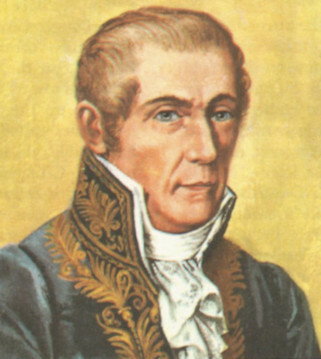 The first true battery (so called Voltaic Pile) was made in early 1800 by the celebrated Italian physicist Alessandro Giuseppe Antonio Anastasio Volta (1745-1827, see biography of Alessandro Volta). The volt, the standard unit of electric potential, was named in his honor in 1881. In 1780, the Italian anatomist and physician Luigi Aloisio Galvani (1737-1798), a friend of Volta (the two scientists exchanged much correspondence), was dissecting a frog affixed to a brass hook. When he touched its leg with his iron scalpel, the leg twitched. Galvani believed the energy that drove this contraction came from the leg itself, and called it animal electricity. However, Volta disagreed with his friend, believing this phenomenon was caused by two different metals joined together by a moist intermediary. Volta verified his hypothesis through experiment, and published the results in 1791. 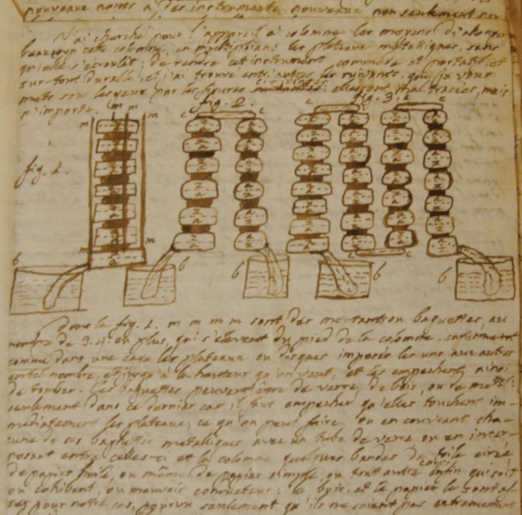 In 1794 he demonstrated that when two metals and brine-soaked cloth or cardboard are arranged in a circuit they produce an electric current. In early 1800, he stacked several pairs of alternating copper and zinc discs (electrodes) separated by cloth or cardboard soaked in brine (electrolyte) to increase the electrolyte conductivity. When the top and bottom contacts were connected by a wire, an electric current flowed through the voltaic pile and the connecting wire. On 20 March 1800 Volta send a long letter (in French, see the image below) from Como, Lombardy, to Sir Joseph Banks, president of the Royal Society in London, of which Volta was also a fellow, announcing his invention (“which will no doubt astonish you”). In April, Banks read the letter and was duly astonished. Volta’s pile was capable of generating a continuous current of electricity. This was a world apart from the static electricity of the celebrated Leyden jar and indeed a most astonishing discovery. No wonder Volta was so anxious to communicate it without delay to Banks and thereby to the Royal Society. Banks was naturally obliged to keep Volta’s discovery confidential, until it appear in print in the Society’s Philosophical Transactions, but in the same April, 1800, he leaks the contents of Volta’s letter to several acquaintances, including Anthony Carlisle, who arranges for William Nicholson to view the letter. In May Carlisle and Nicholson construct a Voltaic Pile according to Volta’s instructions. With this apparatus they discover the electrolysis (how an electric current leads to a chemical reaction) of water into hydrogen and oxygen, thus creating the field of electro-chemistry. 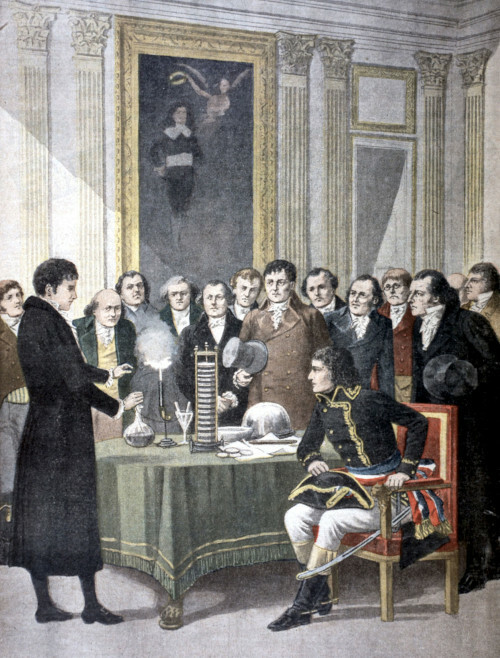 In 1801 in Paris Volta gave a demonstration of his battery’s generation of electric current before Napoleon (see the picture below), who made Volta a count and a senator of the kingdom of Lombardy. In 1815 the Austrian emperor Francis I made him director of the philosophical faculty at the University of Padua. Later Volta went on to isolate methane, discover the methane-air-spark explosion (the basis for the internal combustion engine) and describe contact electricity, the result of contact between different metals, among many other firsts.